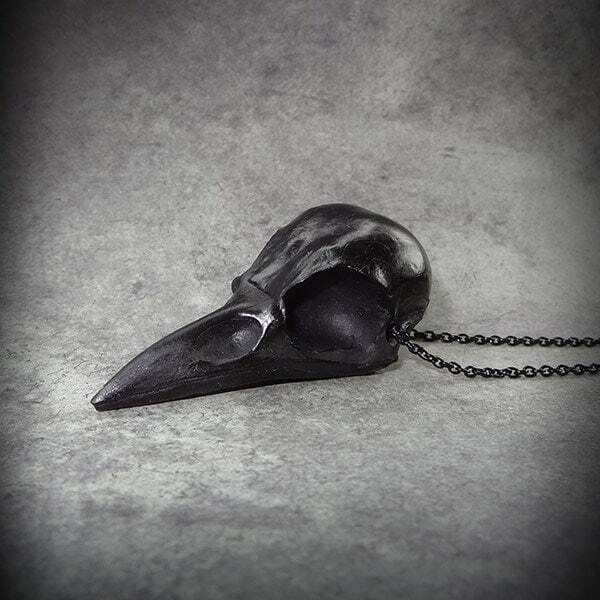 Cast of durable black urethane resin from a real crow skull. Looks just like the real thing. These are hand made, therefore there might be a slight variation with each item. This skull is NOT painted black but instead it is cast with a special rich black casting resin. Small hole drilled horizontally through the top rear of the skull so it can be hung from an 18" black enamel plated chain with lobster claw clasp. If you would like it in another length just let me know. You are sure to get attention wearing this unique and beautiful piece of art! Chain: Comes with black. I also have silver plated chain available (no additional charge, just send me a note requesting it at checkout). The skull replica itself measures approximately 2.5" long. From the tip of the beak to the drilled hole for the chain measures 2". Shipped in a cotton filled jewelry gift box and tied with ribbon, ready for gift giving. All items are made with a lot of love and attention to detail. Customer service is absolutely my number one priority, so please never hesitate to contact me with any questions or concerns. 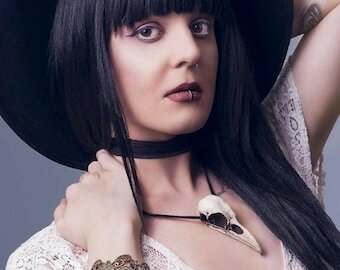 I LOVE my skull necklace. It is so well made and has a great feel and weight to it. Shipping was super quick. I could not be happier with my purchase! This is awesome!! Thank you so much for this cool stuff!! SO COOL. Excellent quality and delicate details. This is a genuine piece of art that has surpassed my expectations. I will treasure this for many moons to come. Thank you Ravens Ranch you are a master of your craft. Payment via PayPal or Direct Checkout through Etsy accepted. If you request a custom order, you have one week (7 days) to pay for the item(s) once I post the listing and send you notification of the posting. If payment is not made by the seventh day, I will send you a final notice. If the items have not been paid for and I receive no response in 24 hours from that contact, I will remove the listing and re-list the items for open sale. If there is a problem, please contact me so I can help you. I do not accept returns for items exactly as described, photographed or custom made pieces. Please ensure the length/size will work for you prior to purchasing. If not, please contact me for a custom listing or designed item that will suit your needs. I typically ship within 1-3 business days in most cases. For custom orders, an estimated shipping date will be discussed at the time the order is requested. All items are shipped via First Class Mail and include Delivery Confirmation. Note - This is not the same as a tracking number and may or may not include updates about your package in transit. It shows that your package was delivered. First Class mail takes an estimated 2-5 days delivery once the package has been accepted at the post office. Please let me know before paying or right after paying if you would like to upgrade your shipping. Upgraded shipping options include: Priority Mail (2-3 days) or Express Mail (next day). Both upgrade options offer full tracking. All orders will be sent to the address indicated on your Etsy Invoice unless you contact me and provide a different address you wish to use. I am honest when it comes to shipping costs. I only charge what USPS charges me for postage and delivery confirmation service, plus just a little extra to pay for the bubble wrap padded envelopes or small shipping boxes (depending on the item). All jewelry also comes with a free sticker and packaged in a small jewelry gift box which I do not charge you extra for. Items are not automatically insured. You must request insurance if you want it, and I will send you an invoice through PayPal. It's not a problem, so please ask if you would like it. I do take the utmost care in packing your items to avoid damage during shipment, but this can occur. Please understand that if your package becomes damaged or lost somewhere between the time I bring your package to the post office, and when it should arrive to your home, I cannot offer refunds or free replacements if the unthinkable happens. Please consider requesting insurance when placing your order if you have concerns and this is something you are interested in adding. If your items weigh less than 1.5 pounds (0.7kg), I will use First Class International shipping to save you money. First Class International shipping can take up to 4 weeks for delivery and does not have the option of tracking available. If you would like to pay extra for faster delivery, I will use Priority Mail International (6-10 days) or Express Mail International (3-5 days) which can be fully tracked. Please let me know before paying or right after paying if you would like to upgrade your shipping. Any customs, VAT, or other import fees or tariffs are the sole responsibility of the buyer. Please do your research before making a purchase so you are not surprised with unexpected charges (above the cost of shipping) once your package reaches customs in your country. ALL animal bones used in my castings were harvested ethically and handled safely. I do not support animal cruelty for the sake of art. PLEASE NOTE - MY RESIN SKULL AND BONE CASTINGS ARE MY ORIGINAL WORK...RE-CASTING, MAKING MOLDS OF, OR REPRODUCING MY SKULLS IN ANY WAY IS NOT ALLOWED!!!! VIOLATORS WILL BE REPORTED TO ETSY IMMEDIATELY AND FURTHER LEGAL ACTION MAY BE TAKEN.